For the chocolate chip recipe I didn’t mix the chips in with the batter – just placed on top – enough for a bit of yum, in a pretty flower. The cookies themselves are pretty sweet so the chips are just for a bit of bling. These are vegan chocolate chips, which I am sure contain cane sugar so technically speaking these cookies are not sugar-free. 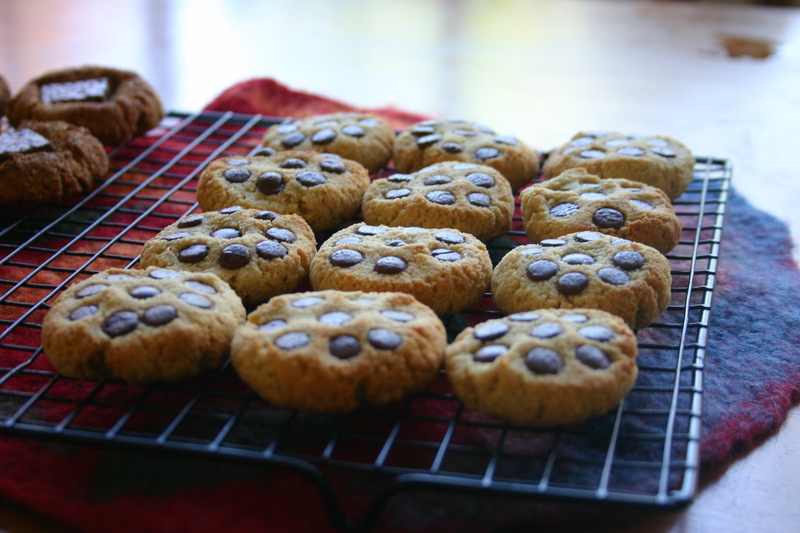 To make this recipe raw the cookies are ‘cooked’ in the dehydrator. They were done after one day and one night, at 70 degrees C, turning them halfway. They can also be baked in the oven for more immediate consumption! The benefits to dehydrating them means they preserve more nutrients and are more evenly dried out, whereas when you bake them they are still a little squishy in the middle, but equally yummy. 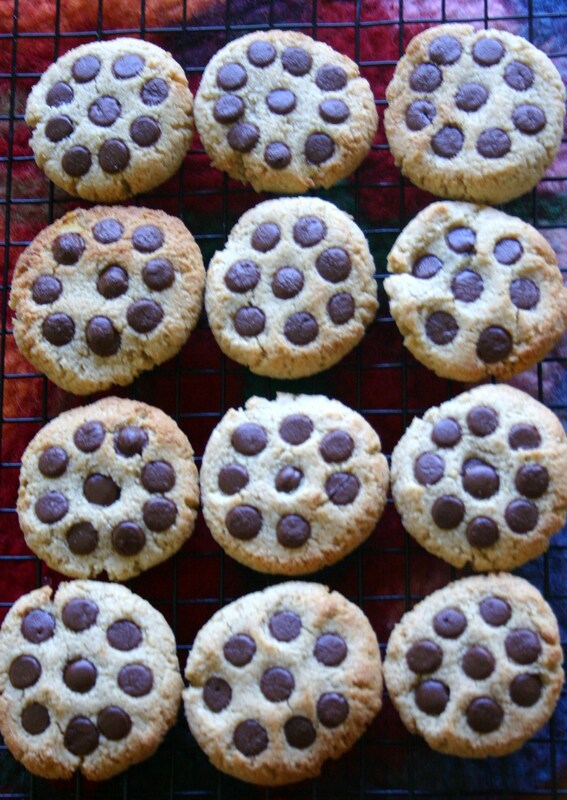 Without the chocolate chips they’d be a good addition for a lunch-box treat (that is, if your child’s school doesn’t have a no-nut policy). They are a great after school snack. Combine all ingredients and mix well. Divide mixture into twelve parts and form into flattened cookies. To dehydrate cookies: place cookies on a baking paper on the trays and dehydrate for 24 hours, turning the cookies and removing the sheet after 12 hours. 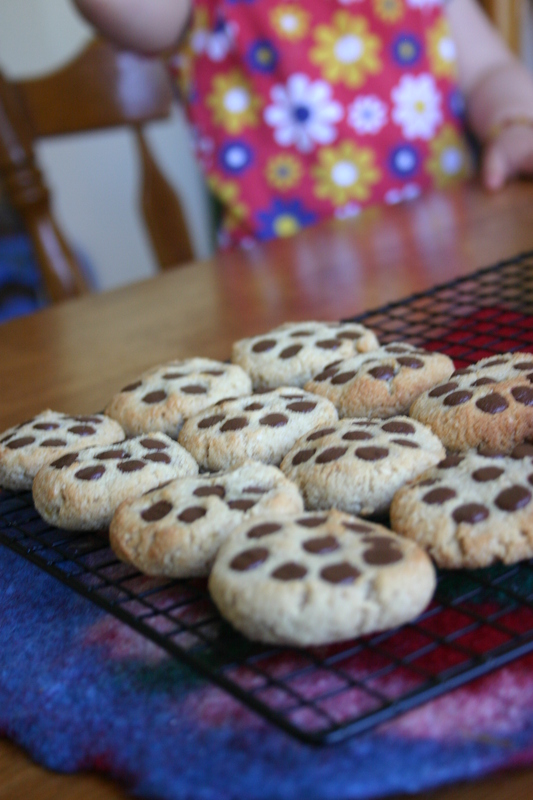 To bake the cookies: place cookies on a baking sheet into a preheated oven set at 160C for 20 minutes.